No one knew more about the geography of North America in his own day than Thomas Jefferson. A skilled surveyor and cartographer, he was engaged in a lifelong search for geographic knowledge. Promoter of four attempts to reach the Pacific, Jefferson personally planned the successful expedition led by Meriwether Lewis and William Clark from 1804 to 1806. 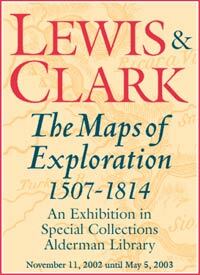 Lewis and Clark: The Maps of Exploration 1507-1814 features the maps that Jefferson had owned and studied as he planned Lewis and Clark’s journey. This exhibition reflects a re-envisioning of the University of Virginia Library’s 1995 exhibition and catalogue Exploring the West from Monticello: A Perspective in Maps from Columbus to Lewis and Clark. This site is the web version of the physical exhibition “Lewis and Clark: The Maps of Exploration 1507-1814,” which was on view from November 2002 through May 2003, in the Tracy W. McGregor Room of the University of Virginia Library's Special Collections department in Alderman Library. The exhibition was generously sponsored by Mr. and Mrs William F. Muenster.